In Acts 12 verse 3 we read that Agrippa arrested Peter because he saw that when he had James put to death that there was “approval among the Jews.” When I read your comment about how we aren’t told why Herod persecuted the church in Jerusalem, I thought about this verse. I think this shines a little bit of light on why Herod is doing what he’s doing. He sees that the Jews approve when he has James killed, so he arrests Peter and this shows that Herod is looking for approval from the Jews, possibly because of the reason you said, that Herod was indeed interested in his “Jewish roots.” I also think that Luke puts this in here because it is another strong “event” I guess you can say. The book of Acts has had a lot of really crazy events in it so far as we have read and this is another powerful story. We see Herod, who was persecuting the church and who had Peter arrested and James killed, get struck down by an angel. And with Herod putting Peter in jail, we also see later a miraculous escape from Peter which is another strong story in the book of Acts. I know those aren’t very in depth profound statements, but I would say it’s important to take note of how many crazy stores are in this book and how strong of a statement Luke makes with them. What a wonderful summary! This will greatly help me with my Sunday School class! Thank you for making it so plain for me! I believe that the post alludes to some very important facts about the killing of James and the parallels of Stephen’s death. This is because as the post says, “Agrippa may have been motivated toward this persecution by the zealous Pharisees (Paul).” The word zealous as we mentioned in class can be related to killing in the Bible because when people were described as zealous it was typically associated with killing. This opinion in the post implies that the Pharisees were so enraged by James and the followers of Christ they wanted to put an ultimate stop to the message of Christ. Agrippa’s persecution towards the Christians, in particular James, I think parallels the aggression from the Sanhedrin’s towards Stephen. This is because similar to James, the most likely assumption was that he and the Christians enraged the Pharisees, as did Stephen. In the case of Stephen, it was further detailed why the Pharisees were so upset with him, because they could not silence him and the message of Christ. This leads me to believe that Agrippa persecuted James because the Pharisees were so enraged by James and the message of Christ because they felt the power of Christ and the influence, and could not counter it so they turned to killing Christ’s messenger. The Pharisees in this day had a major social clout and could influence the decisions of Agrippa, which is what most likely happened because Agrippa wanted to please the religious leaders (Acts 12:3). I believe that we can infer that the killing of James was not motivated solely on Agrippa’s decision but instead Agrippa chose to murder James in order to maintain support from the Jews and use the persecution of Christians as a positive political pawn for him. This is because persecuting Christians would have been seen as favorable in the eyes of the Jews, in the same way as being pro-life is favorable in the eyes of most conservative west Michigan republicans. 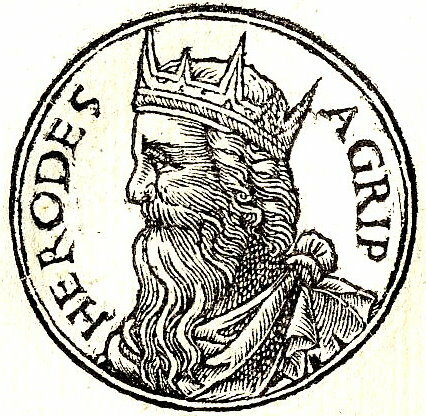 The reason that Herod Agrippa killed James is unknown, but certain influences that may have contributed can be discovered. I tend to take Nick’s side of the argument, that Herod was influenced by the Pharisees to kill James. It may be that the Pharisees were putting pressure on Herod to persecute the church, or it may be the Herod was trying to gain favor in the eyes of the Jewish people. Another theory is that Herod was a pious Jew that believed the persecution of Christians was necessary. “Agrippa is therefore acting like a pious devotee of the Jewish faith by pursuing the leaders of the Christian community who promote the teaching that Jesus is the Messiah.” I think that the reason Herod persecuted the Christians may have to do with both of the theories stated above. I would say that Herod is on the fringes on Judaism, not only because of his education and cultural background that he gained in Rome, but because of his support of the Roman Empire which at the time is the suppressor of the nation of Israel. I feel as if the thought of that age was of the coming messiah of deliverance, which is primary in the Jewish Culture, and as a part of that oppression Herod is very unlike the Jews. He is however pious to a certain degree, his gift to the temple is proof of that, but he is accepted by the Jewish community. I would say that although he is on the fringes of Judaism, he can still be considered Jewish. After reading Acts 12 and the actions that Herod took in persecuting the church, I would say that Herod was probably both on the fringes of Judaism and also motivated by the Jew’s reaction to James’ death as Scott says. I think it is important to note that Herod had already started persecuting the church and had already killed James when the Jews ‘were pleased’ with Herod’s actions. Verse 3 says, “when he saw that this pleased the Jews, he proceeded to seize Peter also.” So it seems to me that he was first motivated by his own beliefs in persecuting the church and killing James, and then was motivated even further when he saw the Jews’ reaction. So I would say that he was extremely devoted to Judaism. The theme we have seen in Acts is the movement of the Christianity outward from Jerusalem, and also theologically through the Holy Spirit. As Luke’s theology expands to where the Holy Spirit is given to Gentiles, Jewish Christians are becoming more and more of a target. Jewish Christians are now doing things and associating with Gentiles which would not be acceptable for devout Jews like Herod. So as the Jewish Christians theology is developing, the more they are being persecuted and being separated from the Pharisees which is seen in Acts 12. Peter, James, and Josh are considered to be the three pillars. They were the leaders of the church in Jeruslaem. It was these three men, besides for Jesus, that started the Jesus movement in Jerusalem. “The Herod mentioned in Acts 12 as a persecutor of the apostles was Herod Agrippa I (10 B.C.- A.D. 44).” (P. Long). Acknowledging that Herod Agrippa was King since 10 B.C. makes it seem odd that he just started to persecute the church now. Of course there had been other Jews, like Saul, who were persecuting the church. But why did he start arresting Christians and even start killing them now? Peter, James, and John have been preaching in synagogues and in the temple that Jesus was the Messiah ever since he had appeared to me after His death. Stephen wasn’t killed for claiming Jesus as Messiah but because he was blaming the Sanhedrin and government officials for Jesus’ innocent death. I agree with Scott’s statement, “It may be that the Pharisees were putting pressure on Herod to persecute the church, or it may be the Herod was trying to gain favor in the eyes of the Jewish people”. This seems like a logical explanation why he would all of a sudden begin to persecute the church. I believe this would be one factor that would put him on the “fringes” of Judaism. For starters, if he was only killing these Christians to find favor in the Jews eyes he probably wasn’t doing other things he should have been doing to find favor in their eyes. Gamaliel was a Pharisee who was respected and honored because of how he lived out his Judaismbelifs. It is written that Herod continued to arrest Christians after killing James because it pleased the Jews (Acts 12:3). Therefore he is not even doing this out of his own zeal, like Paul was before his conversion. This may be proof of where he stood in his relationship with Judaism. Also. I was wondering if the context has any significance. It’s a mystery why in between Paul’s conversion and his first journey there are stories about Philip and Peter and the apostles. Does the placement of this event in Acts have any importance? The interesting thing is that, although scripture gives us what we need, it doesn’t necessarily give us ALL the facts. Actually, Herod Agrippa wasn’t “King since 10 B.C.” … he was born in 10 B.C. (His life story is quite interesting.) 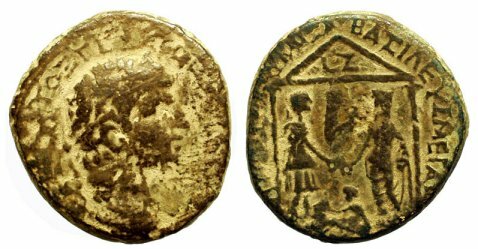 He wasn’t given the title ‘King’ and the whole of Judea to rule until 41 AD – just 3 years before this time. Sometime in that period, he moved to Jerusalem and lived there exclusively. Also becoming quite the pious Jew. Let’s think a moment … he suddenly has the title ‘King of the Jews’ and essentially rules all of Judea (slightly more than even Herod the Great) and even intercedes for the Jews to Caesar. The ever-watchful Romans also noticed how much authority he seemed to be taking on: he placed sanctions on 2 cities outside his jurisdiction without Rome’s approval, was getting quite ‘friendly’ with other neighbors of Judea, and was even told to stop repairs on fortifications of the capital. Why would he want to stop the message of the Messiah? Hmmmm … is it possible he saw himself as a new messiah for the Jews? After all, he was loved by the people, had Ceasar’s ear, was devout, and even held the title “King of the Jews”. Maybe he thought he really had a chance to totally liberate ‘his people’ from the Romans. Kind of hard for HIM to do that as a messiah, though, when others are preaching that the Messiah has already come! Why would they suddenly do this after 10+ years, with no indication there had been any trouble with them in the years just previous to this? No motive. Herod could very possibly have had one. Trying to gain favor in the eyes of the people? I don’t think this was his original plan. Sounds like the execution of James was quite sudden, and the people approved. Once he saw the people approved of what he did, THEN he had Peter arrested, intending to make a big, public affair out of it this time around. Most scholars place the beheading of James and imprisonment of Peter in the spring of 44 AD … with Agrippa’s death soon after. Although I would agree with you there is no evidence Pharisees motivated Herod Agrippa, I will point out the Pharisees (or people like them) seem to be active in Paul’s churches encouraging faithfulness to the Torah in 49-50, leading to the book of Galatians and the Jerusalem Council (Acts 15 mentions Pharisees in particular). By the time Paul returns in Jerusalem in Acts 22, there are many zealous Jews, including priests who now support the messianic movement. I do not think non-Christian Pharisees had much influence on Herod, as I state above he was motivated by his own feelings of Jewish nationalism. I would also point out the nature of his death in Acts 12 probably implies he thought if himself more as a Roman elite, a god like Caligula or Claudius. As for Herod’s dates, my original post gives his birth/death not his reign, so (10 B.C.- A.D. 44) is accurate, and you are correct he reigned A.D. 41-44. The previous comment introduced the error by assuming that was his reign in his comment. I would agree with the post by Jake Fields, this looked very suspicious when Agrippa arrested Peter right after he saw that arresting people of ‘the way’ pleased the pharisees. We also see in the very next verse, (4) that Agrippa arrested him in order to put him out for “..public trial”. I believe that this could have been the motives of Agrippa. As we look back on Paul, before his conversion, we see that Paul was very passionate about punishing people of ‘the way’ and was very zealous about that. Agrippa was obviously just like Paul… or at least it looks like that. Sometimes I would be playing baseball and get very into a play and would try to do too much because I saw that it was pleasing the crowed. Usually this would lead to me being very embarrassed and my Dad coming out to me saying, “alright, Danny boy settle down, you’re a little over-zealous.” Maybe this is what’s happening within the circle of the pharisees, and leaders of that day. People thinking that their way is right and willing to take someones life because of their conviction to their rules. I think we see this a lot in todays Church, people are so set on rules that they miss the real deal. I would have to agree with Pierpont point on why King Agrippa killed James. He was Zealous for following the law and was willing to things to the next level in order to stop the Christians who were wrong in his eyes. As P.Long pointed out in his blog “He therefore kept himself entirely pure; nor did any day pass over his head without its appointed sacrifice.” (Antiq. 19.7.3) If Agrippa spent most of his time in Jerusalem and keeping himself pure you would imagine he would be in with the zealous Pharisees that lived there. He must have known all about what they were thinking and the accusations thrown at them for murdering Jesus. Agrippa had to have been influenced by these Pharisees and therefore decided to use his authority and do what he through was correct, killing James. After he killed James he “saw that this pleased the Jews, he proceeded to seize Peter also. This happened during the Feast of Unleavened Bread.” (Acts 12:2) Agrippa’s zeal for the law and most likely helping the Pharisees that had great influence on him could not have gone better. He gained favor among the people which is something that every King would desire. Reading this post, I could definitely see how Agrippa would be on the “outer fringes” of what it means to be Jewish. As it says in Acts 12:1-3, he saw that the death of James, “met with approval among the Jews,” it seems that Agrippa was more interested in gaining respect among Jews than he was in be a devout Jew himself. It seems that he observed Jewish customs merely because it made him “popular.” As seen with Pilate, keeping peace among the Jews was essential for Roman control. Agrippa was a Roman appointed official, so it could be that he was doing what was necessary to maintain order. He observed the power that the Pharisees had in Jerusalem, and also the potential threat that Jewish Christians posed to peace. In observing these two things, it is easy to see why Agrippa sided with the powerful Pharisees. Agrippa’s seems more motivated by a desire for power and popularity than actual devotion to Jewish customs. I think another possible reason for Herod Agrippa’s persecution of the Jews and executing James is that he was afraid of losing his throne. This would not be unlike the concerns the Herod the Great had back when Jesus was born. (Matthew 2) With the Jewish church claiming that Jesus was the Messiah and that he was alive and coming back soon could have caused Herod Agrippa to worry that Christ was going to come back and take his throne. Or perhaps he was concerned that the Jewish church was going to revolt like many of the zealous Jewish groups of that time period. Killing James could have been an attempted to stop either of those scenarios. My first point I would like to make is I always find it interesting when I hear history about people in the Bible that is not in the Bible. I know and believe that the Bible is true because the Bible says so, but the fact that the world has their own sources validating what Christians believe is pretty cool to me. It just adds an extra element of truth to whatever I read from the Bible. “and was moved to tears” Were Agrippa’s tears those of someone really sad? Or as Agrippa mad that a stranger was going to take what he thought belonged to a true-blue Jerusalem to the core person. I would say it would be a mixture of both. But they had to be tears of a feeling of betrayal as well because he felt so strongly that the brothers should be from one sector and not strangers. It is like one’s favorite baseball player leaving the hometown team to go play with someone else. Obviously, most people don’t cry because of this but I can imagine it was the same type of feeling. I think Herod killed James because it is what the people wanted him to do. Today, Barak Obama makes every politically correct statement he can because he wants to make everyone happy. In Bible times, apparently masses of people wanted certain individuals dead the Leaders did the “politically correct” thing and killed them to appease the masses. The same thing happened with Jesus. The people gathered before Pilot wanted Barnabas set free, so Pilot did what the people wanted and kept Jesus in captivity. I think it is interesting that in today’s day and age, leaders do everything they can to not step on anyone’s toes and back then they stepped on someone’s head to stay off others. Interesting connection between now and then. Are you familiar with the Desire of Ages? And The Great Controversy? I like what Jake said about Herod wanting the approval of the Jews. It sounds like he is really very moved by the Scriptures and he follows the law, but he is still an outsider to the people he is ruling over. He has already done so many things to try to get people to like him it seems. When he sees the way the Jews come together and support him, he probably feels pretty good about this. Also, if he was listening to the Pharisees talk about these Jesus followers so negatively all the time, I am sure it began to wear into him, kind of like watching fox news. Dr. Long–Why was a replacement not made for James like for Judas? I think that that by this point the Jerusalem community looked to James, the Lord’s brother as the “leader” of their community, not the twelve. There is a hint at this shift in 12:17, Peter tells the people who had been praying for him to “tell James what happened,” and then Peter “left for another place.” Jerusalem reformed itself with a council of elders and a single leader, James. This is not unlike Moses in Exodus, or (I tentatively suggest) the high priest and the Sanhedrin, or the Teacher of Righteousness at Qumran. The time of the Twelve Apostles was coming to an end, perhaps the death of James as an ultimate witness to the gospel is a patter for the rest, who (at least in tradition), followed him by giving up his life as a witness to the gospel. I have a question. When Herod Agrippa beheaded James and imprisoned Peter, where was John? I cannot find anything in the scriptures. That is a very good question. Luke does not tell us, and I do not know of any tradition explaining his non-arrest. You would think all the disciples would have been in Jerusalem for the Passover, but it is at least eleven years after the resurrection, so some could have moved to new areas for ministry or some may have died already. Perhaps (and this is highly speculative), John’s ministry took him out of Jerusalem so he was not around to be arrested. On the one hand, there is a strong suspicion John did some evangelism among the Samaritans so it is possible he was there when his brother was arrested. On the other hand, Samaria is not all that far from Jerusalem, so he could have attended Passover. But if he was living with the Samaritans for a time, it is possible he would have been considered unclean, or to have defected from proper Jewish practice by his mission among the Samaritans. In fact, if this Samaritan mission true, then going to the Jewish Passover might have been offensive to the Samaritans he was trying to reach and he simply did not participate anymore. But as I say this is speculation and only that. I highly recommend reading the studies of Daniel Unterbrink on Judas the Galilean. According to Josephus, Paul had a bloody hand in persecuting and plundering James and his Jesus movements, so Paul wrote Acts after his enemies were dead, to whitewash his role in their betrayal. “Judas Iscariot” is a stand-in for Paul’s own betrayal. The name gives it away. Judas was Jesus’ real name. Iscariot is an anagram of sicarii, the name the later Jesus movement (the zealots) gave its assassin faction, led by Judas’ grandson, Menachem.